Community achievements and outstanding contributions by professionals in East Chicago, Hammond and neighboring communities, were recognized during the annual Lakeshore Chamber of Commerce’s annual recognition event on March 9 at Dynasty Banquet Center in Hammond. 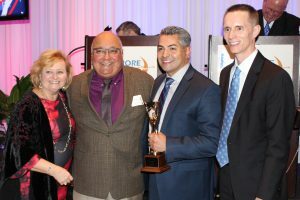 Leo Correa, CEO Community Healthcare System’s Saint Catherine Hospital in East Chicago, and Jeff Williams, general manager Marcus Allard Rental in Highland, were recognized as the chamber’s business persons of the year. Hammond: Thomas Smith, EMT-2; Christopher Barras, senior captain; Timothy Schultz, police officer; and teachers Mira Projovic, Marisa Renwald and Stephanie Vargas. East Chicago: Ameristar East Chicago Casino Hotel, Buckeye Partners, LP, Cline Avenue Bridge, LLC, El Gran Taco, Fresenius Kidney Care, Ivy Tech Community College, Saint Catherine Hospital.